News > 2018 > MBA and McGill–HEC Montréal EMBA: congratulations to the 186 new graduates! MBA and McGill–HEC Montréal EMBA: congratulations to the 186 new graduates! 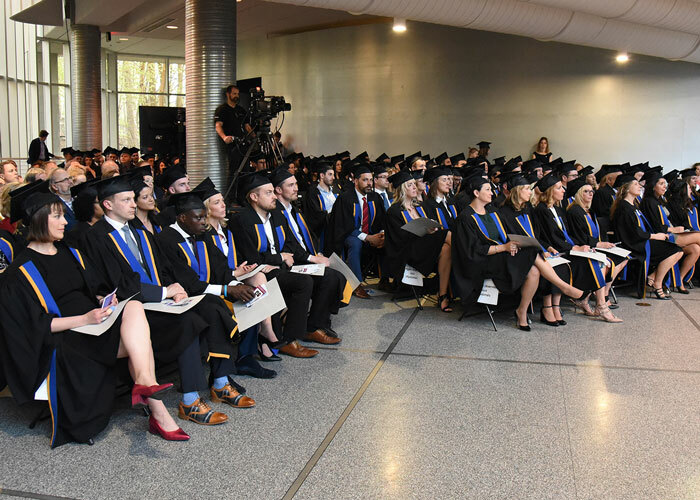 On Friday, May 11, the School saluted the achievements of its MBA and EMBA McGill–HEC Montréal graduates, at the convocation ceremony in its Hydro-Québec atrium. There are 75 graduates from the full-time program and 66 from the part-time program in the 2018 MBA cohort. In addition, 45 students successfully completed the EMBA program this year. A total of 164 of the 186 graduates attended the ceremony, led by HEC Montréal Secretary General Federico Pasin. MBA Program Director and EMBA Academic Director Louis Hébert took the opportunity to congratulate Jason Annahatak, second recipient of the First People’s Scholarship for managers of Indigenous origin, on his success in the EMBA program. Mr. Annahatak is Director, Post-Secondary Student Services for the Kativik School Board.